All 75.000 tickets for W:O:A 2019 are sold - the 30. 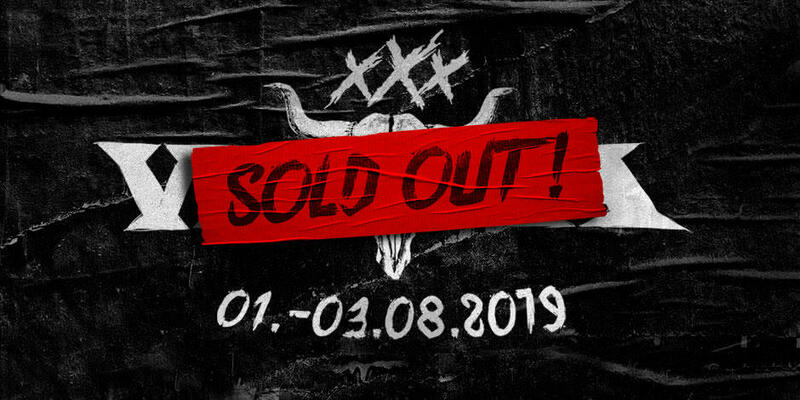 Edition of Wacken Open Air is sold out! We are completely overwhelmed by your loyalty and your support which seems to be unbroken for almost 30 years now and there is nothing more to say than: THANX FOR YOUR SUPPORT! We promise to achieve an Anniversary which you shall remember for a long time! You are and were always the heart of our festival and without you all of this would not be possible! Thank you! Please notice: Within the next 10 days it might be possible that we will get a number of returns due to reversals and not payed advance payments. We created a waiting list for everyone who is still interested in a ticket. Good to know: Our international travel partners ( which can be found here ) as well as the Metal Train still have tickets in combination with bus and train journeys. IMPORTANT: We have started shipping your orders. Please bear in mind that it takes some time to get 75 000 tickets to their owners and that it might occur that separate orders are shipped apart from each other. At this point we would also like to ask you again, to contact the customer support of Metaltix only in really urgent cases and only by either email OR telephone - otherwise the response time for all inquiries increases drastically. THANX FOR YOUR SUPPORT!